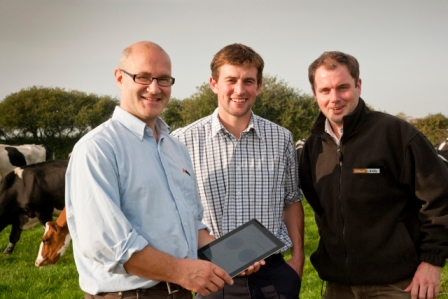 The Alltech E-CO2 Dairy ‘What If?’ Tool allows dairy farmers to instantly assess current and potential environmental performance on farm. The Alltech E-CO2 Dairy ‘What If?’ Tool in partnership with Alltech Environmental Solutions is committed to reducing your farm’s environmental footprint; we are also able to recommend improvements to feeding regimes and general farm practice to help improve efficiency, profitability and sustainability. THE SOFTWARE IS PROVIDED AS IS, WITHOUT WARRANTY OF ANY KIND, EXPRESS OR IMPLIED, INCLUDING BUT NOT LIMITED TO THE WARRANTIES OF MERCHANTABILITY, FITNESS FOR A PARTICULAR PURPOSE AND NON-INFRINGEMENT. IN NO EVENT SHALL THE AUTHORS OR COPYRIGHT HOLDERS BE LIABLE FOR ANY CLAIM, DAMAGES OR OTHER LIABILITY, WHETHER IN AN ACTION OF CONTRACT, TORT OR OTHERWISE, ARISING FROM, OUT OF OR IN CONNECTION WITH THE SOFTWARE OR THE USE OR OTHER DEALINGS IN THE SOFTWARE.